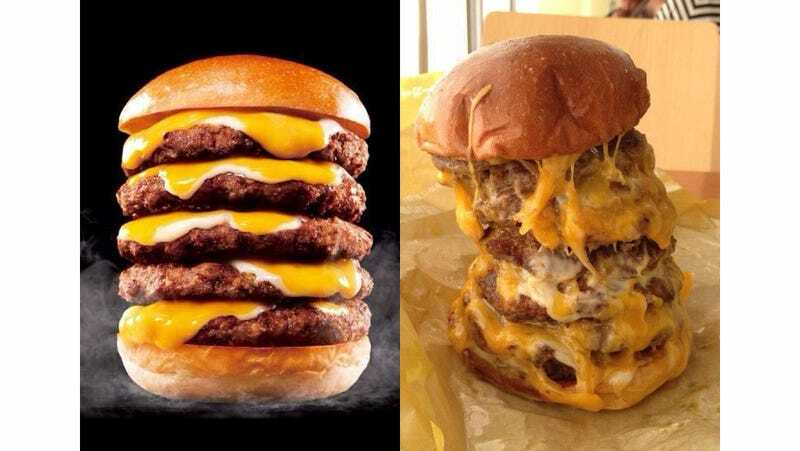 Today in Japan and today only, fastfood chain Lotteria is bringing back its five-patty Tower Cheese Burger for a mere 500 yen (US$4.66). That's a good deal for all the burger—and cheese—you get. Online in Japan, net users were quick to point out that Tower Burger's reality, of course, didn't look like Lotteria's promotional material. (Well, duh!) It looks "worse," and by "worse," I mean I can actually smell the cheese from these photos and hear my arteries screaming. So better? Many of the burgers were a cheesy mess, but a few of the ones that ended up on Twitter, however, actually did look like the Lotteria pictures. Somewhat. The discrepancy was something people online in Japan pointed out when the tower first went on sale in Japan a few years back. And it's something that people will point out when Lotteria inevitably brings the tower back next time.